Searching for gasoline disposal services in Las Vegas? Logistical Solutions is a full-service hazardous waste management company offering a wide range of environmental cleanup and waste disposal services. Gasoline is hazardous and cannot be disposed of in the trash or recycling bins. We offer professional and safe gasoline disposal services. 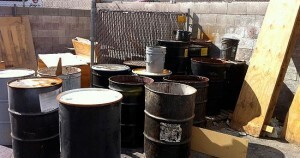 We have the industry-grade tools are used to identify and remove all types of hazardous waste materials. It is our goal to dispose of hazardous waste such as gasoline in a timely and safe manner, while raising the standard of environmental quality in Las Vegas. Contact us for a free consultation regarding gasoline disposal services in Las Vegas, NV.